An estimated 14% of the American population suffers from nail fungus. And of the people who are 60-and-over it is even 40%. What has always surprised me is that fungal nails are usually treated with remedies that are applied externally. Fungal nails develop from within. A fungal nail is a fungal disease for which healing is often only achievable internally. The reason is that a fungal nail is an expression of your immune system. When your immune system is weakened, it cannot deal with fungi properly and they have room to grow. As you may imagine, if you have fungal nails, there is an imbalance of some kind within your body. The fungal nails are only a signal that something needs to be dealt with. How do fungal nails heal? In the past few years, many people started the MIR-Method, and one of the most striking results is that they tell me that their fungal nails have grown out. It begins at the cuticle, where they see a bit of pink nail appear, and in the following weeks their nail completely renews itself. It is a great joy for these people because fungal nails are not something you like to show other people. I recently spoke with her at a lecture in Amsterdam and she enthusiastically told the entire room that she’s going to buy open shoes this summer and her face shone with joy! How does the MIR-Method do that? Fungal nails are dealt with internally, but how does the MIR-Method do that? By doing the 9 steps your body works from the inside out and eventually will cause the fungal nails to disappear. When your fungal nails grow out, it is an important signal that much more is set in motion inside your body! The fungal nails are only the tip of the iceberg of all that has improved inside your body! Step 1: “Optimize acidity” causes balance in the acidity of your skin and nails, which is essential in battling fungi. Step 2: “Detox all toxicity” causes the fungi to be removed. Step 3: “Detach father. Detach mother” helps you to let go of emotions from your father or mother or from other men and women. Emotional baggage is one of the causes of a weakened immune system. Step 4: “Clear meridians” is very interesting with fungal nails since many of the meridians begin or end at the nails. If you have fungal nails on just a few nails, find out which meridians run through those toes or fingertips! Step 5: “Supplement all shortages” is important for your immune system. Supplementing vitamins will strengthen your immune system, which in turn, can take care of the fungi. With step 5, vitamins can be better absorbed from your diet. Step 6: “Balance hormone system” especially has an effect on the thymus with fungal nails. It’s behind your sternum and is incredibly important for the maintenance and strengthening of your immune system. Step 7: “Fulfill basic needs” has an indirect effect on your immune system because you will feel safer, calmer and more secure, giving stress less of a chance to have an effect on you. Step 8: “Optimize Chakras and Aura” is also interesting to take a look at. If your aura is not complete, especially around your feet, outside energy can disturb your nails. When Chakra 1 is disturbed, you are less grounded; you are not firmly attached with both feet to the earth and you have a larger chance of having problems with your feet. And even step 9: “Clarify mission” influences your fungal nails! If you are not working towards your mission you can waste your own energy or hold too much of it in. This is an emotional weight that your immune system doesn’t appreciate. So even step 9 contributes to the surrender of fungal nails, when you continue along your life path! In short, fungal nails are only the tip of the iceberg. This is actually fantastic news, because it means that when the fungal nails grow out, you’ve been through immense changes within! Congratulations! Have you also noticed that your fungal nails have grown out while doing the MIR-Method? Let me know about it below! Wishing you good luck and healthy nails! I woke up in the middle of the night to go to the bathroom and was so irritated. I knew I would be going to the gym in just a couple of hours and wondered if I was going to be able to fall back asleep. Other things spiraled towards irritation as I became increasingly aware of the ever present frustration growing. It was difficult wrapping my mind around how to just ‘get calm’ and fall back asleep. Why I decided to check my emails is beyond me. However when I saw your email I recalled doing the MIR method to aid in healing from post NPD abuse from my mother. It was quite helpful and healing for me. For some reason I thought…why not just do the steps now. I’m in the bed, phone propped up on my chest and thought, what do I have to lose. By the time I got to about step seven a distinct change in my overall well-being was distinctly present. In the back of my mind I thought…if it can quickly change extreme frustration in the middle of the night, you know it’s doing something. Sure enough by the time I finished I was much calmer and quite ready to fall back asleep peacefully. Thank you so much for creating this healing method…it REALLY WORKS!! Blessings to you. Thank you for letting us know! Yes, it is a very good idea to do the MIR-Method at night when you can’t fall back asleep. I always find it sooo funny when people report they fell asleep before they reach step 9. I am also very happy to have been able to create it and never regretted one moment to set it free for anyone. Thank you for sharing and for inspiring others! 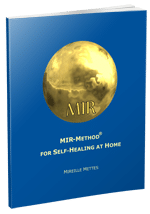 I had begun using the MIR method like a month a go, twice a day, nowadays just doing it once a day. All that I can say is that it has worked some magic on my physical body, I love the way in which the method acknowledges the physical body and gives back its power to regenerate and become healthy again!so, yes, for me it works like a balance lever! I still haven’t worked out yet an issue that I have with my toenail; this affliction (the nail grows thick and has an irregular shape) goes way back from my teenage years. If anyone has any insights please do share!Thank you for sharing! Thank you for embracing the MIR-Method! Yes, a toenail can really take a long time (months) to totally regenerate. Did you read my article about it? 24. Fungal nails are the tip of the iceberg. Sometimes it is just a matter of restoring the calcium balance in your body, after you have shaken off old emotions. Good luck and let me know when you see it grows back beautiful again! I will definitely continue with the MIR method, I have started taking minerals altogether! I will read/re-read the article, the shaken off of old emotions is indeed the issue here; at least that’s how I feel it now! Thank you again for your answer and generosity! It’s such a wonderful thing that I can pass this method on to others! Yes, keep shaking off these old emotions! And thank you for your kind words and for helping me spread the method to others! To make your toe nails grow out healthy again, lots of difficult processes need to take place inside your body. Besides that, it is important that your sugar eathing habits go down. These can only go down with willpower, or because inner grief is going out of your system. If it takes too long, please consult a MIR-Methode coach! They can muscle test for you if there is a strong blockage that is keeping your toe nails from getting healthy again.